The JK WRANGLER REAR TAIL GATE "FINISH" PLATE allows for the removal of the factory tire carrier and plastic venting and finishes the back of your gate with a functional and customized look. Our unique two-piece design eliminates the factory plastic venting allowing for the full functionality intended by the manufacturer while providing a more stylish statement for your JK. CAD designed and laser cut to easily be easily mounted to your JK's tail gate. Introducing MetalCloak’s JK Wrangler Tail Gate Finish Plate. 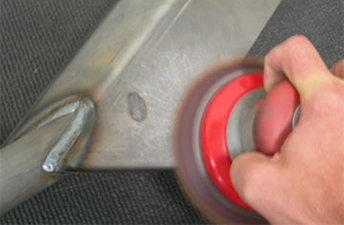 This unique two piece design is used after the removal of the factory tire carrier and venting plate to provide a clean, custom look. The 10GA aluminum plates are CAD designed and laser cut for a precison fit and attach to the existing factory holes for a simple installation; the replacement vent piece prevents water seepage while maintaining the factory intended airflow feature. The JK Finish plate comes in our signature black powder coat or in RAW aluminum for your own custom finish. 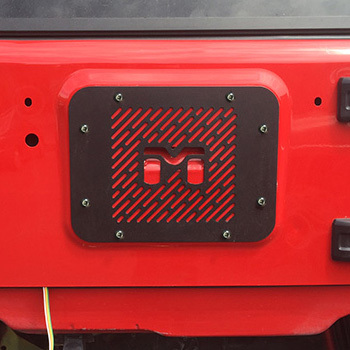 MetalCloak's TAIL GATE PLATE allows you to remove the factory tire carrier and plastic vent and replace it with a custom venting plate.